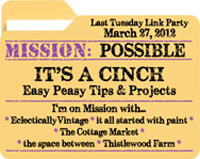 This is a themed link party so please only share your easy, peasy “It’s a Cinch” cinchy projects, okay? Partay even if it’s 7:00am in the morning!!! Thanks for hosting Linda! Lookie me…do you believe i’m not at the bottom of the list! LOL! Keeping in the spirit of Laura’s comment…PARTY ON! Yayyy! So glad to be linking up at all of your places!!!! :o) my favorite bloggers all at one link party=perfect! Thanks for hosting! Loving your button…very clever! What a great event on a great blog!! Thanks for hosting! Hooray for another amazing party! It wouldn’t be a party without you and our other great cohorts! I am so happy to be here, joining in the party. Both of the projects I linked up are easy peasy. Believe it or not I do not have a FB or Twitter account. I love this idea! Thanks for hosting! I always wee the most amazing ideas! Thanks for hosting this, it was so fun coming up with easy/cinchy ideas! Linda, thanks so much for stopping by on my blog and inviting me to this great party! Yes, this is SO much fun! Thanks Linda for hosting and all those who have linked up… P-A-R-T-Y! Thanks for hosting such a great party! I am following you. I can’t wait to check out all the links! Thanks for inviting me to the party! Thanks for hosting!!! Hi Linda! SO nice to meet you. I have perused many of your posts and enjoyed each one. I am a SOUTH Jersey girl 🙂 And I am a new follower. Thank you for hosting and a special thanks for the invite! Hi Linda! Thank you to you and the other hostesses for this super fun party! There is nothing better than a quick and easy project!! Wowzadoodle, Linda! What a fantastic par-taaay! Thank you for hosting! Bummer I don’t have a project right now but thanks for hosting this awesome party. thanks for the invite & thanks for hosting!! Thanks for the party invitation! I will be back! Great party! What a turn-out! Thanks for being a terrific hostess. What an incredible party it was…the crafts were incredible and so are the talented bloggers! Thanks so much for sharing it all with us.